Spectacular, 4 bedroom, 2 bath Cape Cod “Cottage” home completed in June, 2008 Twenty-six windows provide beautiful views of the water. Relax on the front porch and enjoy the boats going by as well as the glorious sunsets. Swim in the warm water in front of the house or spend time at the private beach a few houses away. Try stand-up paddle boarding or kayaking in the gentle waters of the cove. Outside shower to rinse off when returning from the beaches. Our seaside Victorian village center is just a short walk away. Park your car, stroll the water’s edge enjoying all the beautiful views along the way. Our village also features a full schedule of events,(Onset Village Website, Onset Bay Association Website) many fabulous dining venues, shopping, gift shops, day spa, outdoor entertainment, Cape Cod Canal cruises, fishing, kayaking, public boat ramp, marina and boat rentals, endless adventures on the water and limitless views. Enjoy an atmosphere that’s a little quieter and less hurried. A memory in the making. We are a quaint, classic seaside village with wonderful views everywhere you look. 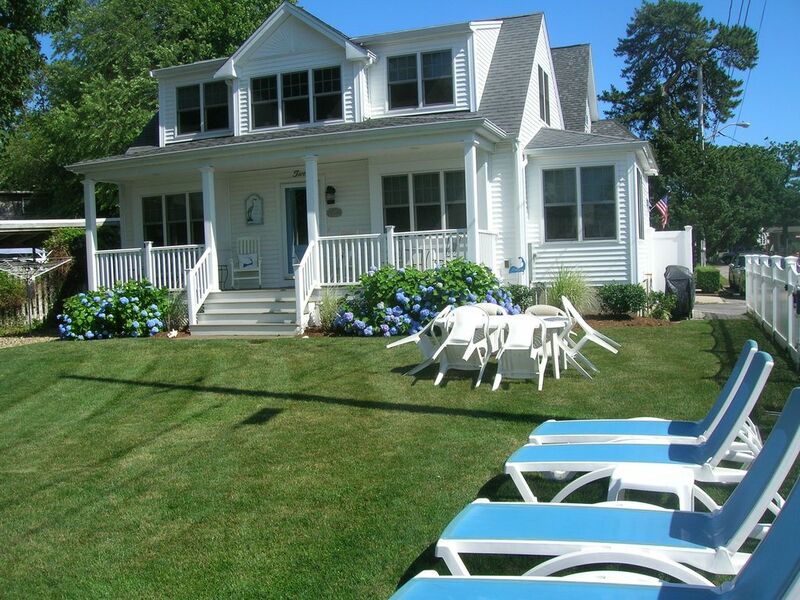 Golfing, water park, Mass Maritime Academy, Marine Life Center, Cape Cod Canal bike path, bridges, major shopping centers and many other activities are just a short distance drive away. Onset beach was the 2009 winner as the best upper Cape beach as voted by the readers of Cape Cod Life magazine with its gentle warm water and spectacular groomed sand overlooking the entrance to the Cape Cod Canal, water surrounds us and you can swim almost everywhere. We absolutely loved your home. You and your husband Walter’s attention to detail lovingly shines throughout. Our family couldn’t have found a better place to spend our vacation. But more importantly, a better hostess than you, Janis. We tried to do it justice by filling it with love, laughter, family, and friends. This house was perfect for our stay. Clean, comfortable, and Janis was extremely accommodating. Close to lots of attractions and the little village is adorable. You won't be disappointed. Perfect Property and Wonderful Location! This place was the first spot for a waterfront vacation. My wife and I brought our kids and have our parents stay at the house for a combined vacation. The beach was perfect for swimming and we took advantage of all that Onset and Buzzards Bay has to offer. The owner was a true pleasure to work with and we could not have been happier with how she managed all the details of our visit. I highly recommend staying here! We had a blast and thanks again for hosting! We had a wonderful stay the house was magnificent everthing we needed for our week in the cape. Kept. We had a wonderful time water was withi. Walking distance. Janis was Great showed us around the property made us very welcomed. Had some brochures and made suggestion of places to visit very helpful. I would definitely recommend this property to friend and family. We had a wonderful week long stay. The house was so clean and beautiful. The kitchen had everything we needed for cooking in. The views were gorgeous. We loved the front porch and front yard. Highly recommend!